⟶ Do you have leave your dog alone for a long period of time? ⟶ Do you have a new puppy who cannot hold their bladder longer then a couple of hours? 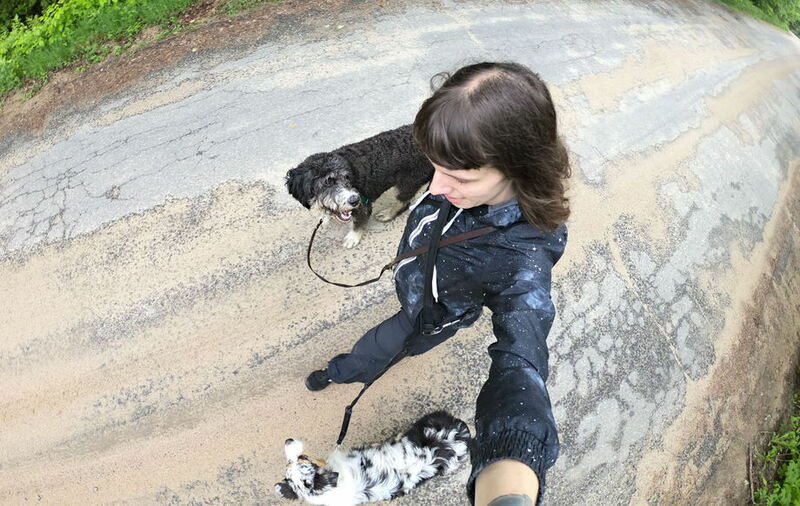 ⟶ Do you want consistency on dog walks for the benefit of your training? Signing your dog up for Walk and Train gives them a chance to do their "business," get some exercise, have social interactions while you are away all the while learning better life skills and using their brain to solve problems. → Exercise and mental enrichment for your dog. → Formal training on the walk and/or in a session before or after the walk. → Texts after each walk along with photo/video updates throughout the process. → A detailed training report card and concise follow up instructions for what your dog learned and how to maintain it. → Unlimited phone and email support afterwards to ensure continued success. 1 meet & greet, 5 one hour training walks and 1 transfer session. Focusing on: Down-Stay, Sit-Stay (anti-jump), Leave-it, and Loose Leash Walking. Focusing on: Loose Leash Walking through walks and games, "heel" training and optional head-harness conditioning. Focusing on: Conditioning a reliable emergency recall, a casual recall and playing recall games. A long line with a harness may be used. 1 meet & greet, 10 one hour training walks and 1 transfer session. Focusing on: Conditioning a dog to enjoy and particpate in: nail trimming, tooth or hair brushing, ear cleaning, examinations etc. 1 meet & greet, 15 one hour training walks and 1 transfer session. Focusing on: Rock Solid Stay, Leave-it, Loose Leash Walking, Heel, Reliable Recall and Off-leash skills. Sign your dog up Walk and Train!